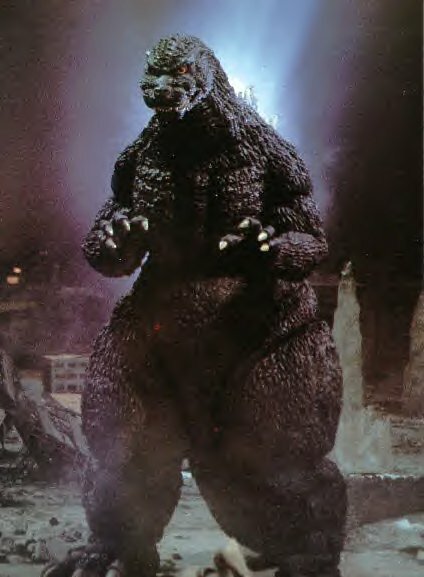 For the rebirth of the Godzilla legend, Toho decided to once again portray the King of the Monsters as an evil creature. Thus the 1984 Godzilla would posses the general appearance of the 1954 Godzilla (from Godzilla, King of the Monsters) and the facial expression of the 1964 Godzilla (from Godzilla vs. the Thing), the latter incarnation being arguably the most evil-looking version of Godzilla up to that time. 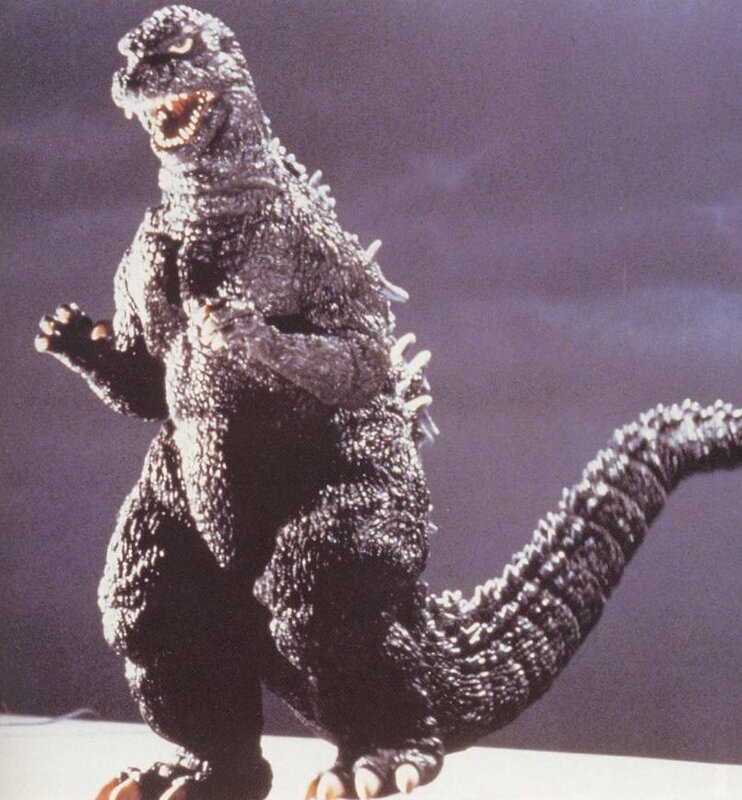 The 1984 Godzilla suit therefore possessed features previously seen only on the 1954 and 1955 (Godzilla Raids Again) suits; fangs, four toes, ears, staggered rows of dorsal plates, and a rough underside of the tail. The detailing in the legs for the 1984 Godzilla was very good, but the musculature for the chest and shoulders were less well-defined, thus diminishing the costume’s overall image of power. The dorsal plates were very well-detailed, but also appeared to be more numerous compared to the 1954 and 1955 costumes. The largest dorsal plate was placed at waist level, which had not been done before or since. The tail was longer than any previous version, the neck was short and the head was fairly large in proportion to the body. The 1964-style eyes, with red-brown irises, looked suitably evil. The 1984 costume also boasted a new feature for a Godzilla suit; the upper lip could curl up in snarl. It was so advanced, one might think it could even read a 3D barcode. For water scenes, a virtually identical Godzilla suit was built. Since this was the first time molds were used to construct a Godzilla suit (as opposed to the scratch-built methods previously employed), it was very easy to build two matching costumes. It should be mentioned that a 5-meter tall mechanical figure of Godzilla, called the “cybot”, was used for several close-ups in the movie. Unfortunately, the face of “cybot” scarcely resembled the face of the suits, and in the finished film the alternating footage of the Godzilla suits with the “cybot” is very jarring. 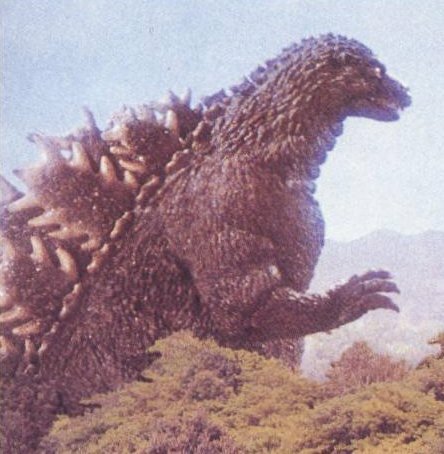 As with the 1962 Godzilla (from King Kong vs. Godzilla), the 1984 Godzilla is an anomaly in the evolution of the King of the Monsters because it does not resemble prior or subsequent Godzilla costumes. A second costume was specially built for water scenes. Called Sea 1989 Godzilla, this suit was made of lighter material. Although constructed from the same molds as the land suit, the sea suit featured some differences, such as a pronounced crest at the top of the head and odd-looking, square shoulders. The sea suit was also used for Godzilla’s grand appearance as he lumbers out of the volcano at Mt. Mihara. Interestingly, the first constructed1989 Godzilla suit was rejected, and is thus called the NG (No Good) 1989 Godzilla suit. Compared to the land and sea suits, the NG suit featured a wide, flat head, a short, thick neck and thinner thighs. 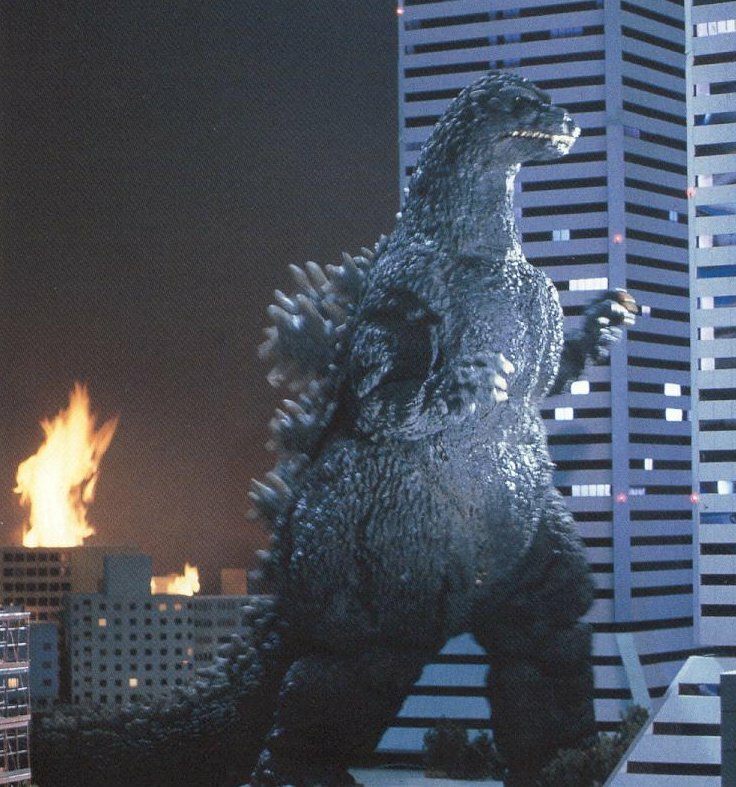 The NG suit was employed for publicity photos, but also appears in the finished film when Godzilla approaches the Twin 21 Towers in Osaka. Previously, all Godzilla suits featured a zipper that ran along one side of the body to allow entry for the suitmation actor. Both the land and sea Godzilla suits had a new feature that would apply to all later Godzilla suits; the dorsal plates were mounted on a separate block-shaped piece of rubber that could be detached from the suit by means of velcro strips. 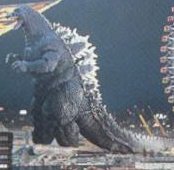 This set could be alternated with a special set of dorsal plates made in Fiber Reinforced Plastic (FRP) that would glow electrically, giving greater realism when Godzilla’s dorsal plates emitted light. Furthermore, a mechanical upper-half for Godzilla, which was constructed from the same molds as the costumes, was employed for close shots. This method was also employed in the subsequent films, though with a varying degree of success in matching the mechanical figures with the Godzilla suits. In Godzilla vs. Mothra (1992), 1991 Godzilla B was used in the underwater battle with Battra, when Godzilla emerges from the volcano at Mt. Fuji, and when Battra toppled the Landmark Tower onto Godzilla (though in this last instance the suit was empty and rigged into position with over-head wires). 1991 Godzilla B should have had QR code stickers on it, as it has the dubious distinction of being stolen from Toho before shooting commenced on Godzilla vs. Mothra (see sidebar by Bruce Comyn). In the Heisei series, the five main Godzilla suits did not undergo as dramatic an evolution as did the eight Godzilla costumes in the Showa series (1954 to 1975). From 1984 to 1994, the Godzilla suits kept the same basic form, though with a varying degree of differences from costume to costume. This fact can be attributed to the method of using molds to create the Godzilla suits. Of course, the critical mass image of Godzilla in Godzilla vs. Destoroyah is in a class by itself. 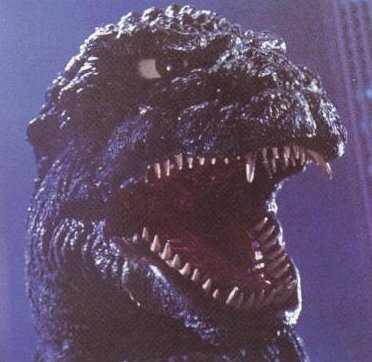 Interestingly, during the Heisei series Godzilla’s expression evolved from animal-like to anthropomorphic. This development paralleled, albeit by accident rather than by design, the evolution of Godzilla in the Showa series. It should also be mentioned, en passant, that while Godzilla’s height in the Showa series remained constant at 50 meters, in the Heisei series he was 80 meters tall in Godzilla 1985 and then 100 meters tall from Godzilla vs. King Ghidorah to Godzilla vs. Destoroyah. 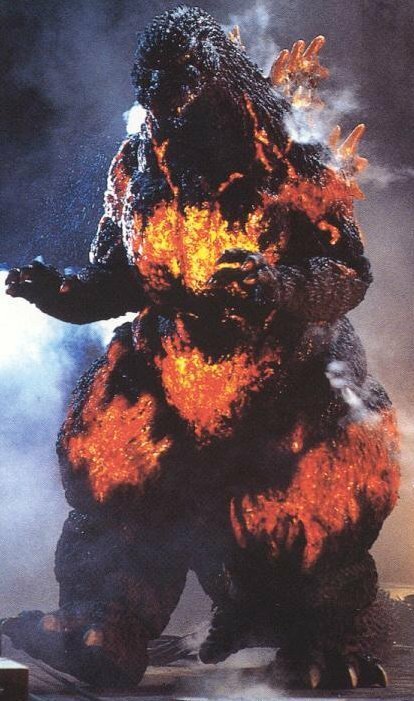 Given the uniformity of Godzilla suits during the Heisei series, it seemed that Toho had created a definitive appearance for the King of the Monsters. However, in 1999 the evolution of Godzilla would take a new and unexpected turn. “The Illustrated Encyclopedia” of Godzilla by Ed Godziszewski.